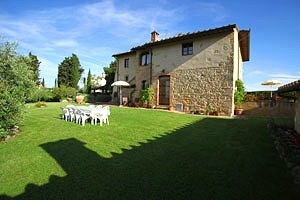 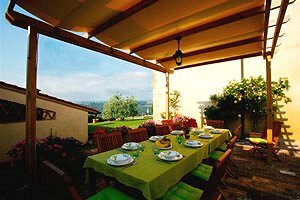 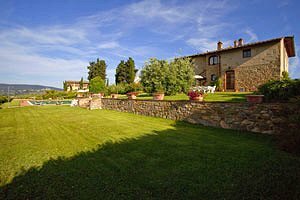 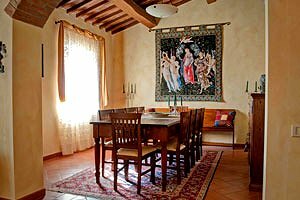 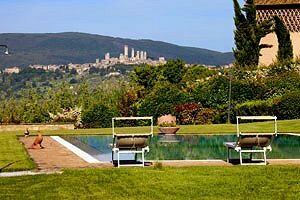 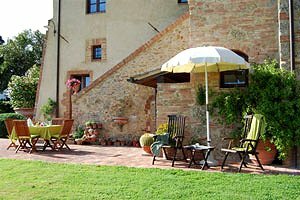 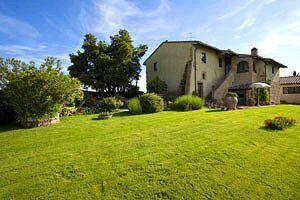 The town of San Gimignano with its towers and the surrounding olive groves and vineyards: that is the stunning panorama the elegant villa situated atop a hill in Valdelda, in proximity to an ancient village near San Gimignano, in the province of Siena, opens onto. 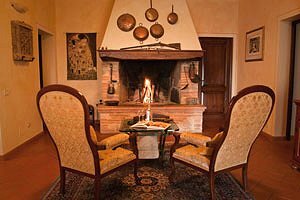 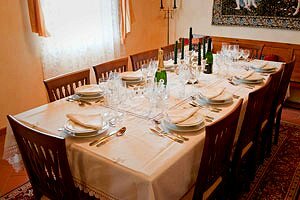 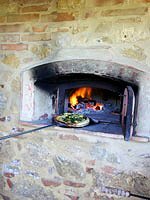 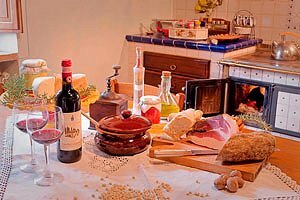 Stretching between Sienese Chianti and Val di Cecina, Valdelsa is rich in important medieval towns - apart from San Gimignano, Colle Val d`Elsa and Monteriggioni are well worth a visit - and boasts an important culinary tradition. 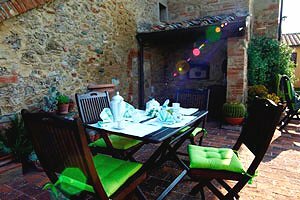 Many important Tuscan cities of art, including Florence, Siena, Arezzo, Pisa and Lucca are within easy driving distance for pleasant one-day trips. 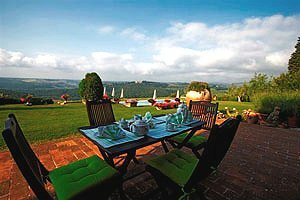 The elegant villa - a former farmhouse built in the 19th century - is surrounded by a wide fully fenced garden in which are a table-tennis table, a wood-burning oven and the barbecue equipment, as well as tables and chairs for having meals in the open air while admiring the magnificent view of the surrounding countryside and the towers of San Gimignano. 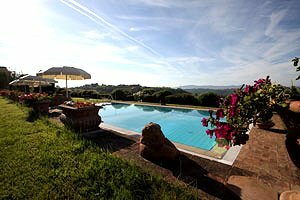 About 20 metres from the building lies the private swimming pool (7.80x14.70 m; depth: 1.20-2.40 m), equipped with an external shower. 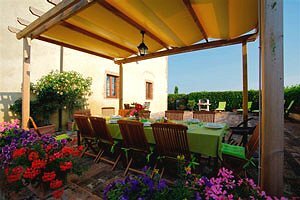 The pool side is furnished with sunshades and deck chairs. 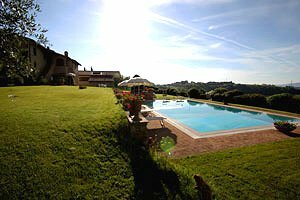 The swimming pool is provided with a night lighting system. 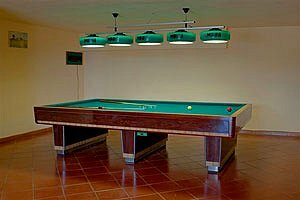 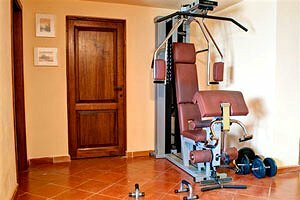 In an annex accessed from the garden are a billiard room, a gym and a laundry room. 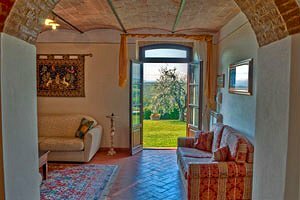 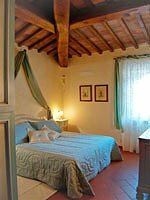 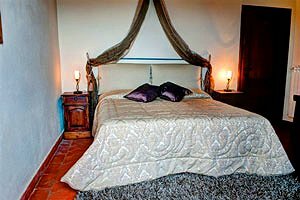 The rooms of the villa have terracotta-tiled floors and exposed beamed ceilings; one of the rooms has a brick vaulted ceiling. 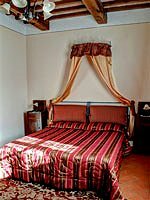 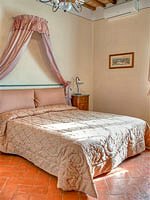 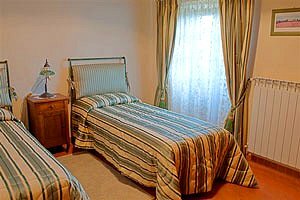 The two-storey building can accommodate 12+2 guests in 1 twin bedroom, 5 double bedrooms and 1 double sofa bed; it also has 5 bathrooms. 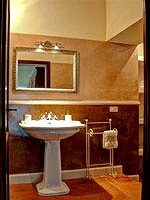 The ground floor composes of bar area with well-equipped kitchenette, room with children toys, living room with double sofa bed, two double bedrooms with ensuite bathroom with shower, a third double bedroom, a twin bedroom and a bathroom with bathtub and shower. 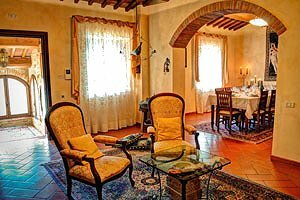 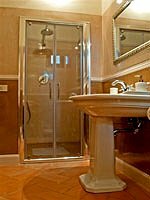 On the first floor are the kitchen, two living rooms (one with library and one with fireplace), a double bedroom with ensuite bathroom with whirlpool bathtub, a second double bedroom and a bathroom with shower. 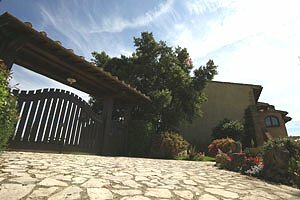 The villa comes with swimming pool with night lighting system, gym, table-tennis table, barbecue, wood-burning oven, billiard table, working fireplace, air conditioning, Internet connection, satellite TV, DVD player, CD player, children`s toys, whirlpool bathtub, electric oven, microwave oven, espresso coffee maker, wine rack, ice machine, dishwasher, washing machine, tumble dryer, cot bed and private car parking space. 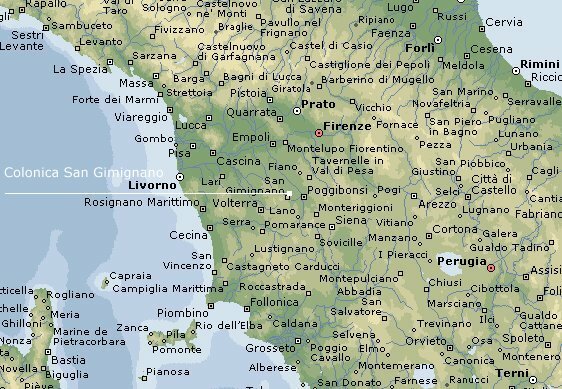 Shops and services of any kind are in Poggibonsi (5 km). 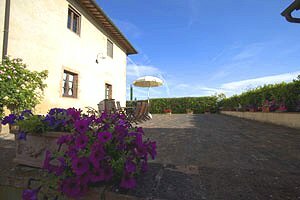 A riding stable and a tennis club are within 6 kilometres from the villa. 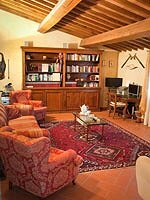 A golf club is 20 kilometres from the estate.